Caribou – Eileen Forbes, 88, was called home to be with her Lord July 24, 2018 at Presque Isle. She was born in Anfield, New Brunswick, Canada the daughter of the late Guy and Madeline (Watson) Ashworth. She fell in love and married John Forbes, a WWII Veteran and resided on the Forbes farm for 71 years. Every day of her live Eileen simply put one foot in front of the other on a path that describes a slow but study arc upward. 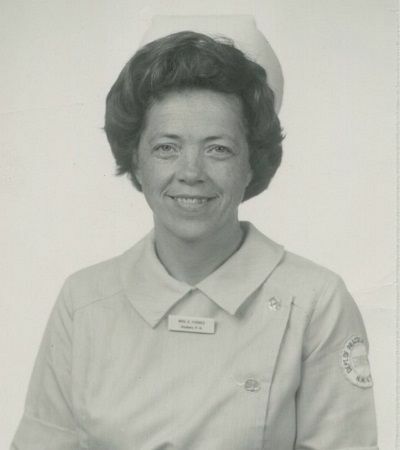 She was a lifelong active member of the Caribou United Baptist Church and enjoyed a long career at Cary Memorial Hospital and Cary Medical Center where she proudly wore her nursing cap every day. She is survived by a son and daughter-in-law, Kent and Kathie Forbes of Caribou, two daughters and sons-in-law, Sharon and Mac Magargle of Maryland and Susan and Jim Beckwith of Arizona. A special son-in-law, Larry Dewley of Michigan, her beloved grandchildren, Heidi Dewley Ellsworth and husband Bob, John Dewley and wife Kymm, John Forbes and wife Jess, and Josselyn Forbes Langworthy and husband Adam, six great-grandchildren, several brothers, sisters, nieces and nephews, as well as her best friend Marge Bell of Caribou. Mrs. Forbes was predeceased by her husband John, a daughter Deborah Forbes Dewley and a special friend Shirley Griffeth. Friends may call at the Mockler Funeral Home, 24 Reservoir Street, Caribou, 6-8 p.m. Saturday, July 28, 2018. Funeral services will be held 2 p.m., Sunday from the Caribou United Baptist Church. Interment will be at the Evergreen Cemetery. Following the services all are invited to a time of continued fellowship and refreshments in the church dining hall. The family extends a sincere and special thank you to the staff at Cary Medical Center and The Aroostook Medical Center for the fine care and compassion shown to her these past few weeks. Have a condolence or fond memory to add?